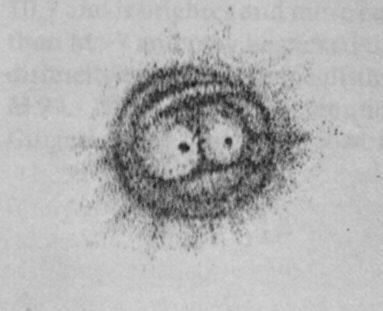 The image above shows the Owl Nebula, as the Irish astronomer Lord Rosse saw it in 1848. William Parsons, the third Earl of Rosse, was one of the last great masters of visible-light astronomy, before the advent of photography and spectroscopy in professional astronomy. A predecessor of Lord Rosse was Friedrich Wilhelm Herschel (1738-1822). With the aid of his homemade telescope, he classified only the lesser luminous objects of the night sky and introduced the generic term planetary nebula. Planets however have nothing to do with these nebulous-looking structures. What we can see here is the end stages of a star with a similar mass to our own Sun. In its fight to the death, the star ejects its outer layer, while the core collapses to a white dwarf, at roughly the size of our Earth. The ejected materials interact with magnetic fields and other interstellar objects, leading to a bizarre variety of shapes and colors. The modern image of the Owl Nebula (up top) clearly shows both eyes and a red border surrounding the nebula. You can find the Owl Nebula in the constellation Ursa Major, which is high in the norther sky. 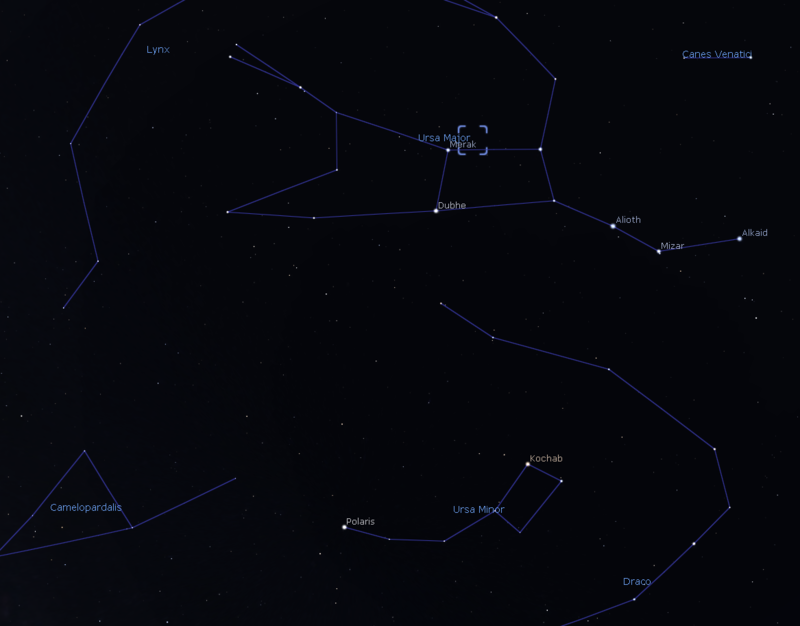 The image below represents a view of Ursa Major in the evening sky on Friday. First direct your gaze to the North Star, leading you to the Big Dipper or the Plough, which is upside-down this time of year. The Big Dipper is a part of the constellation Ursa Major. The position of the Owl Nebula is marked by a blue square. 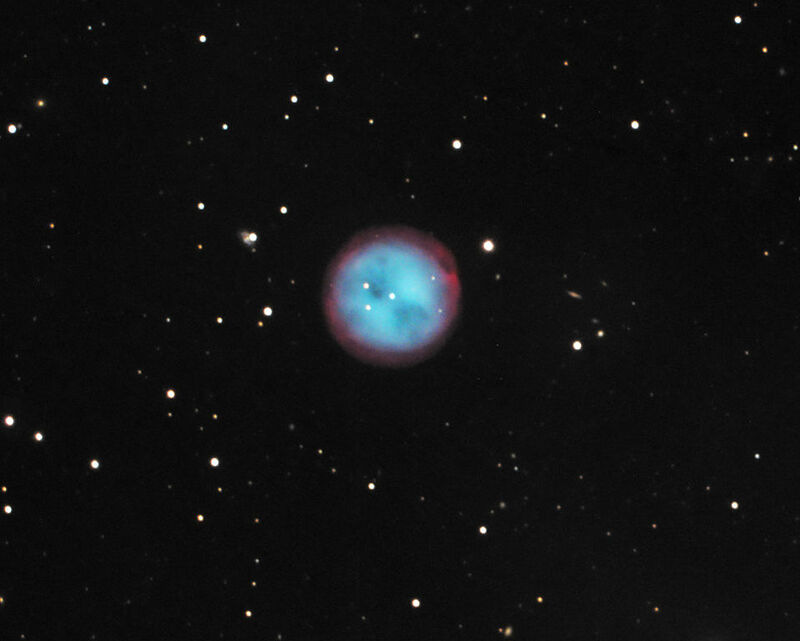 Under a dark, country sky, you can see the Owl Nebula with a 10×50 Binocular. If you have a Universe2go, you simply need to look into the northern sky in Deep-Sky Mode, in order to see the Owl Nebula and get some great background information. These days, many telescopes are equipped with computer-guided instruments, e.g., GoTo-Telescopes. In object selection of a computer-guided telescope, the Owl Nebula can be found under M97, meaning the nebula is the 97th object in the famous catalog of Charles Messier (1730-1817). In order to see both eyes of the Owl, you will most definitely need a telescope, a dark sky and some practice. Following the observations of Masters Herschel, Messier and Lord Rosse with your own telescope is quite exciting. The best set-up for these observations would be a Dobson, since they offer a lot for the money. Of course one of similar stature would do, such as the telescopes of our astronomy great grandfathers.